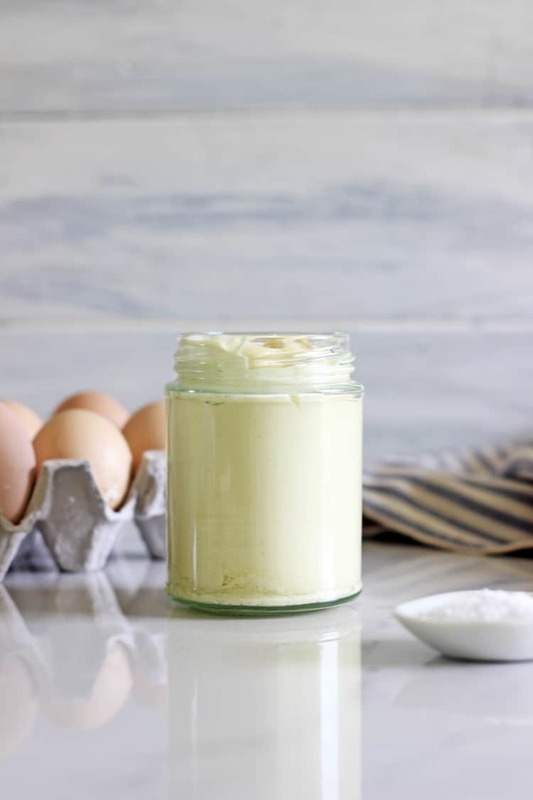 How To Make Homemade Mayonnaise in less than 2 minutes! You will never go back to buying it from the supermarket after you learn how to make it at home! 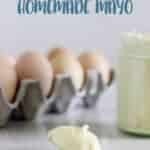 I’ve gotta tell you, I have NO idea why it has taken me so long to try making homemade mayonnaise! Out of all the things I make from scratch, this is probably the easiest. I mean bread, ice cream and marshmallows are a piece of cake but for some reason mayonnaise seemed kind of intimidating. Maybe it’s because so many recipes tell you to slowly stream the oil into the mixer as you are making it and there just seem to be so many things that can go wrong. Well not anymore! Add ingredients to a tall jar. Place the immersion blender in the bottom then turn it on, and slowly bring it up through the mixture. 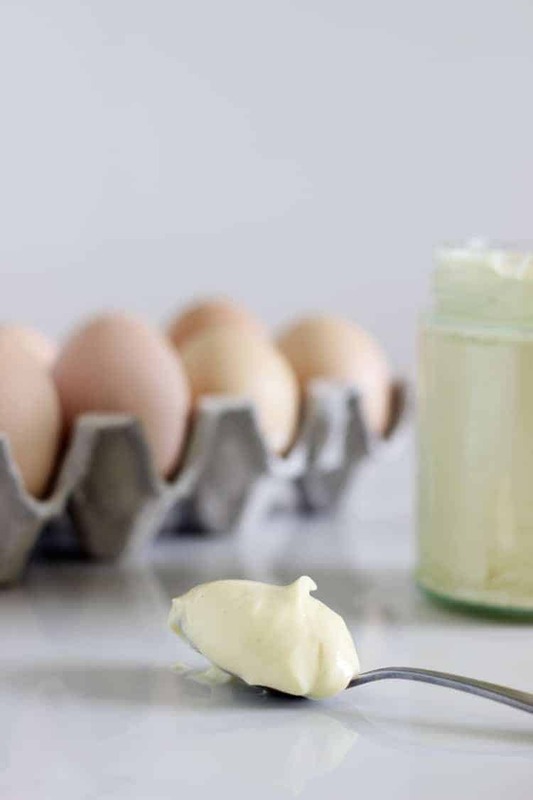 It will turn to thick creamy mayo in less than 1 minute – it really couldn’t be more simple! Click here to pin this recipe to your made from scratch recipes board to save it for later. 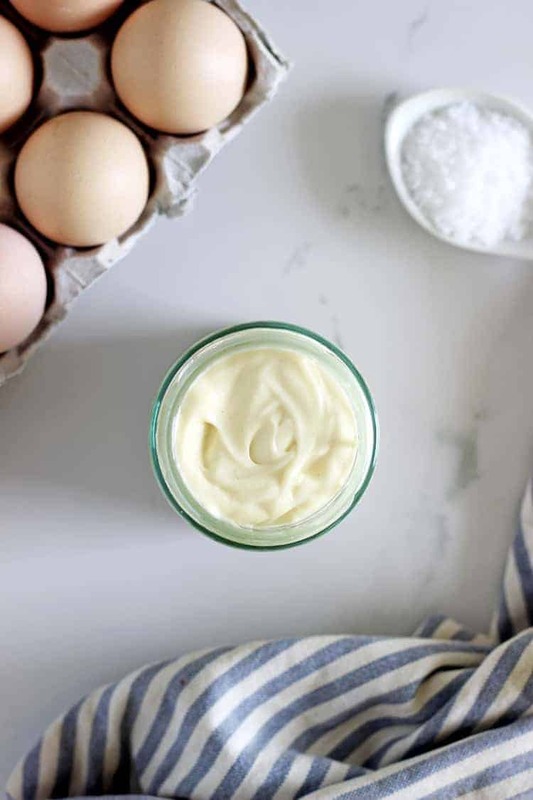 Once you have the technique sorted, you can play around with ratios of vinegar and mustard – I like my mayo to be slightly tangier but you can add less if you like it more mild, or even more if it’s not enough! Also, play around with the type of oil you use. I wouldn’t recommend olive oil as it has a very strong flavour but try avocado oil, sunflower oil or even just plain old canola oil if that’s what you have. I used grapeseed oil as it’s a nice neutral oil that is perfect for dressings. The important thing to note is that this dressing does use a raw egg so if you are a bit wary of that, it may not be for you. It’s hard to say how long it will keep for – I have kept it in the fridge for about a month with no problems, but as with anything, use your best judgement. If it looks or smells strange or you are just not sure, it’s best to throw it out. 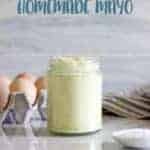 This mayo is perfect in sandwiches and wraps, in potato salad dressing or in mashed eggs for sandwiches. 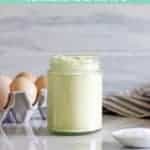 How To Make Homemade Mayonnaise in less than 2 minutes! You will never go back to buying it from the store after you learn how to make it at home! Keeping the blender off, put it right to the bottom of the jar. Turn on the blender and leave it sitting on the bottom of the jar until the liquid in the jar starts to look like mayo. Very slowly with the blender still running, bring it up through the ingredients until you get to the top. The mayo will continue to thicken. Once the blender reaches the top and all the oil is mixed in, you are done! Turn the blender off, taste the may and season it to taste. Mayo will store in the fridge for up to 1 month. I’m the same as you- mAke heaps of things from scratch but was very slow to get on the mayo bandwagon. But started about 6 months ago and never bought it since.